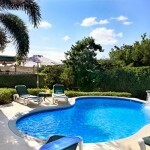 Hoppe’s Pool and Spa with follow a systematic approach when locating your pool leak. The process involves collecting and analyzing a great deal of information. Knowledge of swimming pool operation and construction, use of specialized equipment, and on the job experience will all come into play as they locate leaks in your pool. 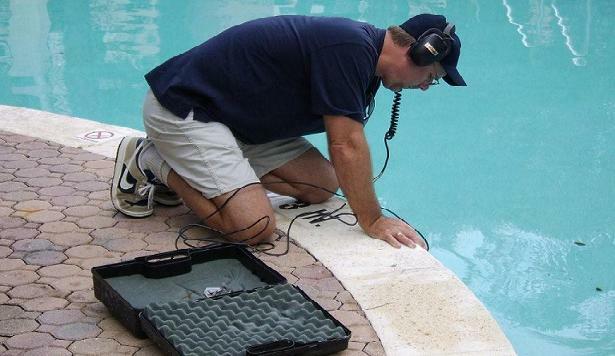 The first step for any pool leak detection job happens before Hoppe’s ever gets to your pool. You should be prepared to provide information about your pool or spa to the technician over the phone or contact form when you first call. When did you first notice the leak problems? How much water is losing? What type of pool is it? The more information you can provide about the suspected pool leak the better. Based on this information, Hoppe’s will be able to give you an idea of what type of detection or repair will be required and schedule the job. Keep in mind that due to the nature of leak detection work this scheduled time may be somewhat flexible..
Once our technician is at your pool, the first step usually involves a pressure test of your plumbing lines to confirm whether the leak is in the plumbing or the shell of the pool. This testing will be done with specialized test plugs and pressure induction systems that are designed to give quick results. Based on the results of the pressure test, the technician will then use a variety of tests involving sophisticated electronics or diving equipment to pinpoint the pool leak. Hydrophones (underwater microphones), special dyes, and SCUBA diving equipment are used to find leaks in the shell of plaster and concrete pools. Once the leaks are found most simple repairs (such as one or two vinyl patches), can be made immediately. Further repairs to cracks, underground plumbing, or pool equipment however, will usually involve additional work and tools and will be quoted separately. Hoppe’s is prepared to do these repairs. Call today if you think your pool may be losing water.